The Calcutta High Court on Thursday revoked West Bengal government’s notification prohibiting Durga idol immersions from 10 pm of September 30 till midnight of October 1, the day of Muharram, citing law and order reasons. The earlier prohibition was from 6 pm of September 30 till October 1. The High Court has now permitted idol immersion on all days till midnight and has directed police to ensure that the routes of idol immersions and Muharram processions do not clash. The Acting Chief Justice Rakesh Tiwary clearly said that a mere assumption that a law and order situation might arise, owing to Vijaya Dashami and Muharram falling on the same date, cannot be the basis for imposing curbs on idol immersion timings. The Acting Chief Justice said, “let Hindus and Muslims live in harmony, do not create a line between them”. This is clearly a slap in the face of Mamata Banerjee government which was trying to appease Muslim vote bank by imposing restrictions on idol immersions. Her government had imposed similar prohibitions last year too, and also prevented Hanuman Jayanti processions and worship of arms by Hindu organizations. The state government’s actions have caused serious apprehensions in the minds of Hindus in West Bengal. 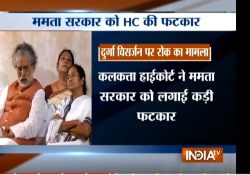 The action of Calcutta High Court is welcome and timely. It is time for Mamata Banerjee to understand the feelings of people, but, as Union Minister Babul Supriyo said, Mamata ‘didi’ will not try to understand because she cares more for her Muslim vote bank, and not the interests of the state.